It’s not really a sequel or a prequel, but a story sort of told obliquely to the excellent novel Borne. It’s a story about a truly alien creature in a strange and ruined (at least from a human perspective) world. Short and heart-breaking, it provides an insight or another way of thinking about Borne, even though I think it could stand along on its own merits. Ultimately, a meditation on the cruelties human beings inflict on non-humans, simply by being unable to imagine the value of non-human perspective. It’s not a nice book, but it did get me thinking about the value of compassion toward all of the wondrous variety of living things in our world, not because of what they can do for us, but simply because they’re alive. 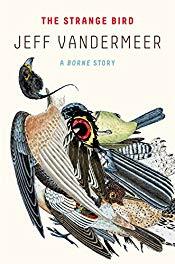 I’ll read pretty much anything that VanderMeer writes, I think because he really gets at a certain weirdness and emotional intensity that I really dig. I think this short book stands as one of his strongest works.